Robertson gives us book two in the Persephone Alcmedi series, proving that this is an author and series to follow! Johnny, the irresistable tattooed alpha were is now Seph’s boyfriend. Who else is glad that she got over her prejudices and saw the man behind the tattoos? He has her best interest at heart, but in true alpha male form he makes some choices that benefit him without considering what his actions could mean for Seph. Too bad for Johnny he brings Menessos a little closer to Seph in the process. Menessos...Menessos. Do you love him, his Arthurian aura, charisma and all. Or do you hate him, he is controlling and does something only when he can be benefitted. At times you will feel a little of both, and as frustrating it is as a reader it is so much more for Seph. Robertson does a wonderful job of writing Menessos, giving and pulling at the right moments. All the men drama aside, Seph has her hands full trying to compete for the position of High Priestess. A position that she wants to pass up, but can’t. It is interesting to get a view into the inner workings of the witches. There are some powerful old ladies here, and lots of political inner-workings. 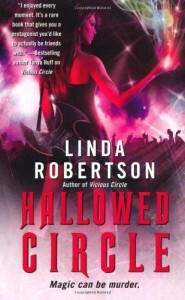 Robertson writes a great ending for Hallowed Circle. Wraps up the storyline of the High Priestess and leaves you hanging waiting for more.